The legend of Bonnie Parker and Clyde Barrow is fueled in part by the passion they had for each other, but Bonnie was legally married to another man the entire time. Just a few days before turning 16, Bonnie married high school classmate Roy Thornton. Their marriage quickly fell apart and, after he went to prison for robbery (she had interesting taste in men, clearly) in 1929, she never saw Roy again. Soon thereafter, she met Clyde and the deal was done. They fell in love and were together until that fateful day of the shoot-out — May 23, 1934. 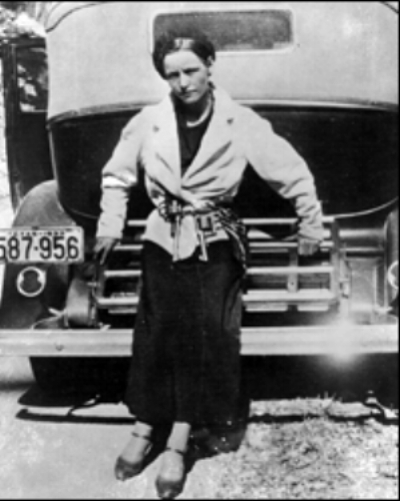 But on the day of the ambush, she was still wearing her wedding ring from 1926, and had a tattoo on the inside of her right thigh with two interconnected hearts with “Bonnie” and “Roy” inked inside. That tattoo must have driven Clyde crazy every time he saw Bonnie naked. In our book, Resurrection Road, Bonnie and Clyde aren’t killed in the ambush. Instead, they are forced to work for the government to try and protect the president from an assassin.